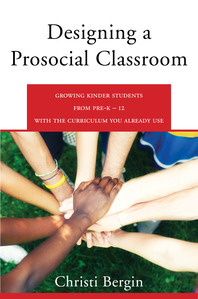 Designing a Prosocial Classroom - Description | W. W. Norton & Company Ltd.
A prosocial classroom is easy to spot! Students are engaged in learning, have a warm relationship with the teacher and can collaborate smoothly; conflicts and behavioural problems are the exception rather than the rule. Not only are students happier in this kind of positive environment, their academic achievement improves. But it's far from obvious how to establish and maintain such a productive and peaceful classroom. In Designing a Prosocial Classroom, Christi Bergin has distilled the complex literature about social-emotional learning into a set of tools that all teachers can use to promote prosocial behaviour. As with any skill, fostering kindness and collaboration requires deliberate practice; but it does not require a separate curriculum. These research-based tools—using effective discipline, building prosocial habits, developing positive relationships, modelling good coping strategies—are teaching practices that can be employed within any content area during regular instruction. Each chapter includes authentic classroom vignettes, highlights from the research on prosocial behaviour, and questions for reflection and discussion. Designing a Prosocial Classroom is an engaging read and an ideal resource for a school-wide book study group; included in an appendix is a case study for review and discussion of the teaching tools presented in the chapters.